Jammu & Kashmir Chief Minister Omar Abdullah flagged off Right to Information (RTI) Bharat Yatra on June 16 in Jammu, organized by Mahiti Adhikar Gujarat Pahel (MAGP) amidst clear signals emerging that the powerful tool promoting transparency may come under Government of India scanner, with efforts being made to point towards how RTI has become a "hindrance" to growth. Supported in J&K by Sangharsh J&K RTI Movement, the multi-media van, RTI on Wheels, will become the vehicle of MAGP’s RTI Bharat Yatra across India over the next few months. MAGP and Sangharsh RTI Movement J&K are part of the National Campaign for People’s Right to Information (NCPRI) and the Association for Democratic Reforms (ADR), the two national platforms seeking to promote transparency in governance. During its all-India campaign, which will continue for the entire year, the MAGP’s RTI on Wheels will be supported by respective state organizations making RTI as a tool to bring about greater transparency in governance. 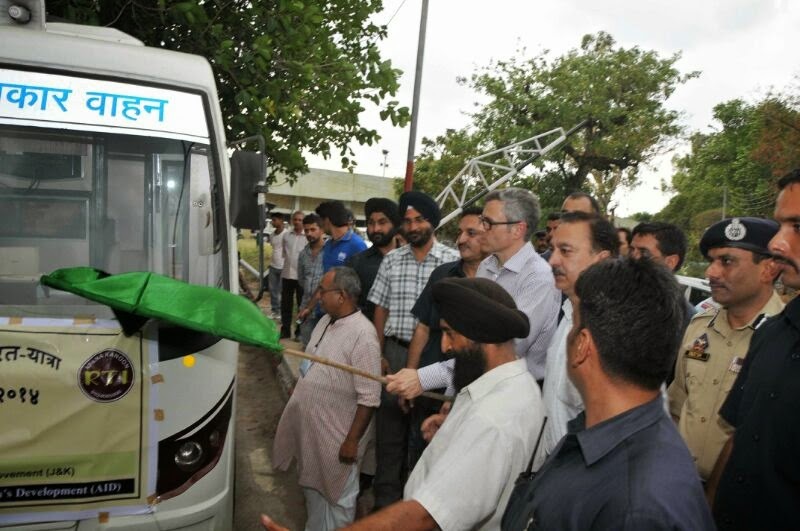 India’s first multi-media van for RTI awareness, RTI on Wheels is supported by the Association for India’s Development (AID), a volunteer group mainly consisting of Indian scholars in various universities in the US. AID has been supporting several people’s organizations across India for quite some time now, including the Agariya Hit Rakshak Manch, working in Kutch among salt-pan workers. The programme has been launched against the backdrop of government effort to curb the voluntary sector’s foreign links in some measure. An Intelligence Bureau report to the Prime Minister’s office recently blamed India’s voluntary sector for retarding the country’s economic development by 2-3 per cent. Already, the view has gone strong among certain circles close to the establishment in Delhi that RTI is proving to be a “drain” on government resources. The Reserve Bank of India recently prepared a report which said that nationalized banks should be kept out of the RTI purview, for which, if needed, these should be privatized.